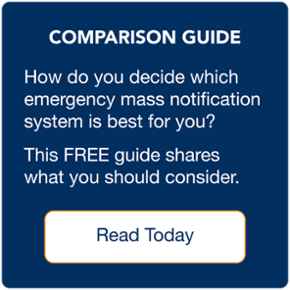 You should decide how to use your emergency mass notification system. RMS is the developer and provider of Advantage, the industry's most flexible and adaptable emergency mass notification system. 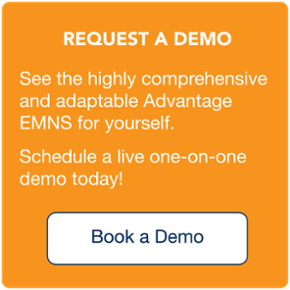 The Advantage EMNS is a complete solution with 7 tightly-integrated modules including: Messenger, Mapper, Library, HotLine, Crisis Manager, Roll Call, and myAdvantage. And it's sold as a complete system (the opposite of add-ons) and backed by an abundance of Administrator tools and settings that provide advanced flexibility. The Messenger module ensures the right message is sent at the right time, to the right people, and on the right device. Advanced features give you the power to handle multiple languages, time zones, poll users, transfer recipients, and so much more. Powered by Esri, the emergecy-grade Mapper module provides a way to quickly draw an impact zone and select recipients. With weather and other information rich overlays it's easier to get a quick understanding of the event at hand. RollCall is the perfect module when you need to know quickly if your stakeholders are OK during an evacuation. Or, to facilitate routine check-in of employees traveling to, or stationed in, parts of the world where there is an elevated risk. This bulletin like module gives your stakeholders the power to proactively retrieve the most up-to-date information, instructions or event status updates. You can be sure private messages stay that way based on individual stakeholders permissions. Mobile Apps built to save lives. We developed two powerful mobile Apps to enhance its enterprise-class emergency mass notification system: RMS Mobile, designed for recipients and RMS Messenger, for system administrators. When every second counts, sending critical communications in a few screen taps and receiving them instantly through push notifications brings your crisis management and business continuity plans to a whole new level of effectiveness. The Library module gives your response team secure, reliable, and permission-based access to important documents, Access them from anywhere at anytime then download or attach to a message. Proactively collaborate with your team using pre-defined situation templates based on your business continuity or disaster recovery plans—while maintaining a clear audit trail and unambiguous record logs. Empower your stakeholders to update their contact information to save time and enhance accuracy. Don't want to give up control? No problem, you can choose which recipient contact fields are visible and editable. The Administrator gives you advanced flexibility to configure your EMNS to meet your unique requirements. You have control over security, groups, roles, permissions, device orders, defaults, reminders, lexicon, divisional access, database maintenance, and much more. It’s one thing to create mass notification software that stands up to any type of emergency. It’s another to stay one step ahead of evolving technologies and industry trends. But it is something else entirely to do both without losing touch with what the end-user needs and wants. We pride ourselves on our ability to deliver enterprise-class, scalable, and relevant solutions while still working closely with our customers. What's the RMS Advantage difference? First-class responsiveness combined with enterprise-class capabilities. In an industry where getting there first matters, we invest in research and development to stay on top of emerging technology and industry trends. We are always looking to deliver enhancements to our solutions—sometimes before our customers are aware of the need. We are in this for the long haul. Our highly-trained team works with our customers to understand their goals and guide them through a comprehensive (custom and live) implementation and training process. And we continue to work collaboratively with our customers on an ongoing basis to ensure the RMS Advantage emergency notification system is configured to suit their unique needs. If a customer requests added functionality, we do our best to accommodate. No red tape or market analysis. In fact, over 80% of our product development road map comes directly from customer input. 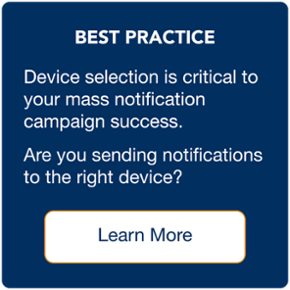 In a crisis, having one unified system that can handle all outgoing and incoming automated notifications simultaneously is essential. We focus on what we do best: emergency mass notification software. It is a cohesive solution…not a piece of one. No plug-ins, add-ons or extras. It's also adaptable and flexible with the industry's most comprehensive API. That means you can configure it to suit your exact needs, and easily integrate it with other 3rd party complementary alerting technology–or with your existing database software.